If you are a lover of videos, you can make some cold hard cash while you enjoy your favorite pastime – watching videos on your phone. There are a number of companies that will help you get paid to watch videos, so get comfy and hit play as you are about to make some quick cash without even lifting a finger. Get Paid to Watch Videos: It Works! Nielsen has been around for a while and is a reputable company that has changed the way it measures viewers habits. Long gone are the TV devices it used to use, as now the company uses the Nielsen Digital Voice to determine viewing habits of video watchers. Simply download the Nielsen app and make your way to more money on your computer or mobile device. You’ll get paid to watch videos online as you earn rewards towards sweepstakes entries that add up quick. Nielsen gives away $120,000 a year and $10,000 a month to its panel of video watchers so the more you watch, the better your chances of winning are. Plus, Nielsen rewards members with smaller cash prizes all year long. You just never know what and when you will win. Nielsen also pays users for their web activity so as long as you are using the app from the company, you’ll earn sweepstakes entries. It also gives rewards for taking surveys so you can’t lose no matter how you decide to play. For more ways to earn money, here is how you can put your smartphone to use and how to make money from your phone photos. Swagbucks is a simple way to make some moola while you get up to speed on your favorite topics and issues in video form. From world news to sports and celebrity news, Swagbucks allows you to watch a variety of videos for payment. You’ll earn points for each video you watch and can cash your Swagbucks in for gift cards or cash through PayPal whenever you want to get paid. Members can earn up to 150 rewards points a day. Just download the Swagbucks TV app, and you’ll have the potential to earn up to $90 a month just by watching videos through the app. Plus, Swagbucks will pay you, even more, to take online surveys, surf the web, and online shop, making it pretty easy to get some extra cash for lunch with your friends or possibly even to pay your rent. Just sign up on the site and let the money start rolling in while you make money watching videos. Pretty simple, right? Click here to join Swagbucks, earn a $5 signup bonus and start earning rewards for the things you do online! Believe it or not but Netflix will also pay you to stream and tag its shows to help provide more accurate recommendations to other subscribers of the platform. The company hires what it calls taggers to view its streaming content and often lists open position on its Netflix job board. You just have to keep checking as these positions go fast. While this is an opportunity to watch some popular shows on the site, especially if you already have some favorites it is time-consuming and not as lucrative as one might think. But, if Netflix is your jam, it is a pretty simple way to get paid to watch videos. If you are a huge fan of YouTube, you’ll want to get in on this video service’s ability to pay you for watching videos online. The Paid2YouTube will allow you to get paid to watch YouTube videos you already enjoy. 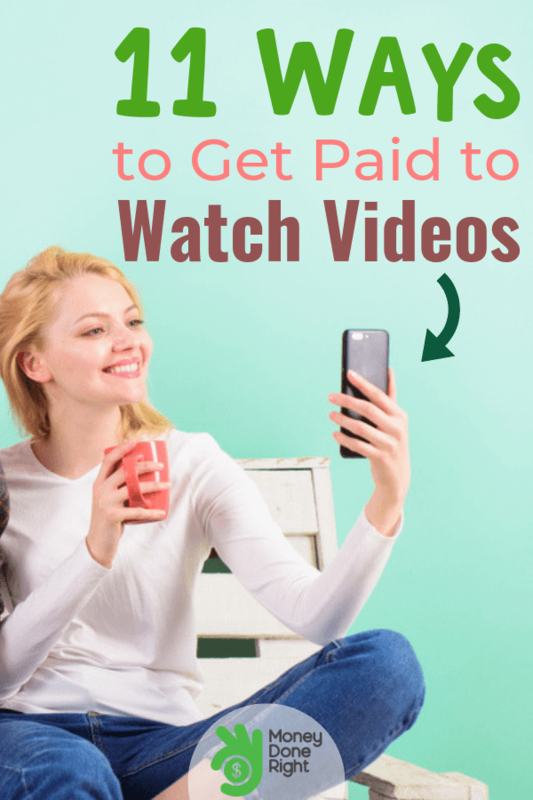 You’ll earn some cash for just watching the videos posted on its website, which is a pretty simple way to make some money. You can earn even quicker cash by rating the videos, leaving a comment on the video, or subscribing to the channel. Also, if you refer a friend to Paid2YouTube, your cash value rating will go up, even more, giving you plenty more to be thankful for when you watch the videos on this site. Paid2YouTube has over 600,000 members with more being added every day. It rents these members to YouTube posters as a way to promote their videos on the site. For you, it is a great way to make money watching videos from a popular site that you trust and already use. After you have accumulated $10 with the site, you can cash out your earnings and YouTube will pay you through your PayPal account. Talk about an accessible way to make some money doing what you already love doing – watching videos. Life is good with the Paid2YouTube site. Looking for new ways to make money from your phone? Here is a our millennials’ money guide to earning online. As you might suspect, National Consumer Panel is part of Nielsen and the IRi brands that together formed a joint venture where they track the personal tastes and habits of consumers. While the company is more focused on tracking what you buy when you shop, it does offer video surveys that you can take for money. The company collects opinions on the videos that you watch as part of an advertising strategy for its clients. You’ll need the app on your phone to get paid to watch videos online. For each video that you spend your time watching, you’ll earn rewards that can be used to buy gifts from the company or use them for entries into its sweepstakes that can net you some fast cash. Earn even more points the longer you participate in the program as the points value gets even higher. Plus you’ll earn entries into a series of sweepstakes that are held every week, month, and quarter. The grand prize is a whopping $20,000. Reward possibilities also include cash Visa rewards cards, Amazon gift cards, iTunes gift cards, or a Kindle Fire. Like videos, you can also get paid to watch commercial advertising with JingIt. While it may seem a little on the irritating side to have to be exposed to commercials at all, this sitepays well, and you will be compensated for watching ads on a variety of products and services. If you customize your ad watching experience, so that you are a more targeted viewer as well as sharing your opinion of the ads, JingIt will give you even more cash. Plus, with the site, you can watch as many or as little of ads as you like without being penalized. And, you can watch these ads on multiple devices, allowing you to earn even more. The payments from JingIt allow you to use your reward points for movies, TV shows, and music which is an easy way to get your digital fix without opening your wallet. While no cash is exchanged with the site, you can earn plenty of points to support your viewing and listening habits – not a bad deal at all. Perk is the ideal platform to get paid to watch videos as the videos are shorter than most sites. You can earn Perk Points by watching movie and app trailer as well as watching popular videos you would probably spend time watching anyway. Perk points can be redeemed for cash, gift cards, merchandise or if you are in a generous mood, you can donate your points to your favorite charity. Beyond the Perk Points that you will earn, you can also receive Perk Tokens that enter you into sweepstakes with the company, where you will win prizes for cash, gift cards, and electronic merchandise – say hello to a new a tech device. And, if you use Facebook, you’ll earn even more points towards the cash you are looking to make. The site also doles out Perk Points for answering pop quizzes and doing some web searching when you are on the site. You can also shop online or even download and use new apps on your phone for additional points to redeem. It is a pretty slick way to earn a buck. Viggle is another great way to get paid to watch videos as you’ll earn points for viewing your favorite TV shows that you would lay on the couch watching way ways. Just sign up on the site and download the app. You’ll need to use the app when watching TV or streaming Netflix, Amazon Prime, or Hulu, but you can watch any of these sites to earn cash. The points program works by letting you make money watching videos with one point per minute earned. There is even the option to earn a 10 times bonus where you’ll make some serious cash at the price of 10 points per minute. Talk about adding up fast! Viggle offers a large array of videos that you can watch from game shows to options that allow you to interact with friends that are members of the site too. And if you watch new shows along with your favorites, you’ll get extra points to add to your account – giving you even more ways to earn on the site. Points from Viggle can be redeemed for cash when you have a prepaid debit card, or you can turn them in for prizes or gifts cards to all the places you love to go. There are over 800 plus gift card options and prizes. Video watching just gets easier and more plentiful with this site. For more ways to make extra money, here are 49 sites that pay you to do things you are doing already. Slidejoy is the perfect way to watch those interactive videos that you love while you make some dough. The site works by displaying an ad on your phone when you unlock it. You can dismiss the ad with a right swipe, but if you swipe left, you activate the advertisement, and it will take to its website. Here, you will interact with the site which could include watching a YouTube video, looking at an advertiser’s website, or activating a digital coupon. It doesn’t really matter if you dismiss or interact with the ad as you will earn the same amount of points either way, which seems like a no-brainer but still. You can also earn Google Play credits which can save you even more on your tech fun. If you refer a friend to Slidejoy, you’ll get additional points as well as for linking to your Facebook account. For now, you can only use the app on Apple and Android phones, but there are plans in the works to offer the app on tablets. Fingers crossed that it will and make it easier to get paid to watch videos. By using Inbox Dollars, you can get paid to watch videos that are short in length on a regular basis such as every single day. The company pays cash for each video that you watch and will give you $5 right away just for signing up on its site. To make it even easier to watch these videos, Inbox Dollars lets you know in advance the duration of the video which can range from a few minutes to a half hour, but it possible to earn as much as $225 a month for watching videos on the site. That’s some serious cash for watching videos. Inbox Dollars says its members have earned over a staggering $57 million to date, which may make you want to get on this video-watching extravaganza. The site has over a million members and is active in the U.S. and the U.K. It generates payment for its members by the results it creates for its advertisers. The site also allows you to earn some dough by playing online games, taking surveys, searching the web, or signing up for promotional offers. Inbox Dollars will also pay you to open emails, making it pretty easy to earn quick money and get paid from the company. Click here to sign up for Inbox Dollars, get a $5 reward for joining, and start earning money for doing various tasks online! This site will help you make money watching videos if you live in the U.S., Canada, or the U.K. The site lets you earn money that can be redeemed for cash or gift cards to your favorite stores or restaurants. If you are really in need of some cash, this is a good site to get on quick as it will let you cash out your money for as little as a penny. Gift cards can be cashed out in $5 increments at the minimum. In most instances, you will get paid out in 72 hours, making it simple to have your money in hand at a moment’s notice. Gift cards take a week to arrive. Members of QuikRewards can also make money by taking surveys, reading emails or shopping online. Online will net 25 percent cash back on your purchases, making it quite lucrative if you are an avid shopper. You can make money watching videos without having to leave your house or go to work. These 11 sites are all great options to get paid to watch videos that you probably would spend time doing anyways. Keep these companies in mind the next time you are absentmindedly watching videos on your phone as you could easily be raking in the cash. It doesn’t get any easier than this to earn while you watch the videos that you love. Remember you could be getting paid for this! Looking for more ideas on how to make money online? Check out this article. Do you know any other websites that pay you to watch videos and we haven’t included in this article? Let us know in the comments!